A great pickling variety, straight and uniform. 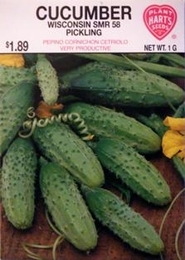 Wisconsin SMR 58 produces an abundance of pickling cucumbers on vigorous vines. A very dark green and of excellent quality, the fruits have a slight taper at the ends. Resistant to Cucumber Mosaic Virus and Scab makes this variety a reliable performer. Seed spacing - 4-6 seeds in a ring about 2 inches across.